The update to version 1.09 of IntelliScreen fixes a few bugs and adds one new feature. The update to version 1.09b of IntelliScreen fixes a bug that made the app crash if it was the first time it was being installed. The new feature on version 1.09 is the ability to add a Location Label to weather locations. 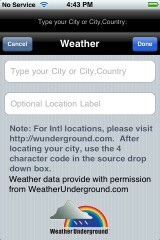 The only way to see utilize this new feature is if you delete your Weather locations and re-add them. Because there is no way to edit previously added locations. However, when you add a new location, you will notice a Location Label option. When you add a Location Label, it will change the title of the Weather to whatever you have in the Location Label:the city or zip code you entered. The bug fixes are listed below. You can get IntelliScreen via the IntelliBorn source. This program crashed my phone too, yesterday. The same for me: Pay to have your iPhone frozen. Niiiice! So it’s free again? i remember it used to be free, then they started charging something like $30 <— INSANE!! Free? Since when is a 10 day trial considered free? That’s correct, this is not free, just the trial is, I will change this in the article. Oh, I didn’t know it was a 10 day trial. I just saw at the top of the page it said Price: Free. Doesn’t matter to me anyway since I have the 3G now. and 49 bucks for that app is just crazy… for that or any app, a cellphone app is going to cost more than a cheap phone?????????? it froze my iphone, i wouldnt install it. i’m bout to restore my phone. at least have a stable, reliable app that is compatible with future firmware before charging $50. you can get like 10 really great apps in the app store for that price. It’s a great app in theory, but not worth the money. Especially with all the bugs. My iPhone gets stuck with Apple logo after reboot, can somebody help? I’ve read previous post that they had to restore. I’m not really sure what that meant? Do I need to Jailbreak and Unlock again? Used Ziphone before to upgrade to 1.1.4.
when the Iphone told me that there was an update to 1.09, then ofcause I did that. That was a great mistake. Now the phone stops/halts/freeze at the apple logo, and I have tried every little cowboytricks to solve the problem, but its impossible. 3 times I have written to intelliscreen for asking what to do, but I never hear anything from them. I really think that there are many great possibilities with this app. but dear Intelliscreen company, if you really would like people to support your company an buy your software as I did, then you at least could give some kind of answer back . Just because the apps. works great at your testlab. on one or two phones, thats not equal that it then works on thousand others iphone.. I presume thats why I newer hear from intelliscreen. Another good thing for getting happy customers, was to have a more informative support page, were we can read an follow the problems with the differents version that we report as having a problem. So dear intelliscreen folks.. don´t hide in the closet, let us see what going on. you that this problem goes on for ever, and no. my cal is not busy ! !! Installed via Cydia and now none of my app store install apps work. I restored the phone and tried once more and low and behold same thing. 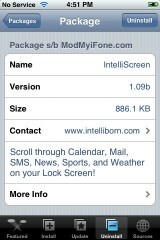 I have not seen this on any forums but at least for me intelliscreen on a 2.0.2 2g phone breaks app store apps. Anyone else notice this?